Formerly Stratford No 1 branch, Central Line East branch includes LUL station staff (SS, SA(CR), SAMF, CSA) at all Central line stations from Holborn to Epping, Cleaners on these stations, LUL Train Operators and Instructor Operators and Sodexo canteen staff at Leytonstone depot. 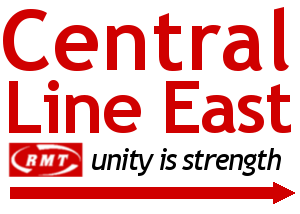 Central Line East branch meets on the second Thursday of every month 17:00-19:15 at the ex-Services club, Leytonstone - map here. We congratulate the London Transport Regional Council for its production of anti-sexism posters and A WOMAN’S PLACE IS IN HER UNION badges, and advise the union to produce these for national distribution. Please download and distribute Stratford branch newsletter using the link below. You can view it by clicking here. This summer will see Tube staff of all grades working really hard to transport Londoners and visitors during the Olympic period. With the main venue being in Stratford, the Olympic Games Live Sites in Victoria Park and Hyde Park, and Marathon Swimming and Triathlon event in Hyde Park, the Central Line -our RMT branch’s area -is right at the heart of it. We appoint Sisters Maria Taylor (TfL no.1 branch) and Esme Bradbury (Stratford no.1 branch) as delegates to TUC Disability Conference 2012, and additionally appoint Brother Marr and Sister Booth to represent the Council of Executives. We instruct the General Secretary to ensure that these delegates receive all relevant information and support to attend this conference. Here are the branch minutes for Stratford No 1 branch for February 2012. Click 'read more' to see them, or download the original document below. We note that the meeting referred to in our decision of 6 October 2011 has yet to take place, due to the representatives not having been available. We instruct the General Secretary to write to Stratford no.1 branch advising that unless the representatives make themselves available soon, we will be unable to progress this matter; and to invite LU Engineering branch to send an appropriate representative to this meeting. A report of the meeting is to be placed in front of us once it has taken place. With 44 years service and only 13 working days until his retirement, Steve Hover, a respected and well-liked Loughton driver, was summoned to attend a Local Disciplinary Interview (LDI) for infringing LUL’s punitive sickness policy, and given a vindictive 23-week warning. Here are the draft minutes for Stratford No 1's AGM meeting.